Boublil & Schönberg’s Miss Saigon has firmly settled back into the West End and is still bringing audiences to their feet (and me to tears) night after night. Thanks to the lovely people at Seat Plan, I was lucky enough to see the show for the fourth time from the fourth row of the stalls! But as my last visit to London’s Prince Edward Theatre was for the legendary 25th Anniversary Gala, I was keen to see if the cast were still up to their usual tear-jerking standards. Based on the opera Madame Butterfly, the musical follows Kim, a girl made an orphan by the Vietnam War, who falls in love with an American GI despite being promised to her cousin, Thuy. The couple are cruelly split apart as the American army leaves Vietnam and Kim fights for years to be reunited with the man she loves. There has been a slight cast change since my first three visits to Saigon, with Ethan Le Phong replacing Kwang-Ho Hong as Thuy. Ethan’s character doesn’t have the most stage time in the world but he didn’t waste a second of it. I was blown away by his performance – it was believable and emotional. The way he haunted Kim was truly terrifying and I really felt the love for Kim and his passion to win her back. The rest of the leading cast remains unchanged and as the last time I saw the show was at the anniversary gala, I was wondering if they could possibly match up to that performance. The answer was largely yes! 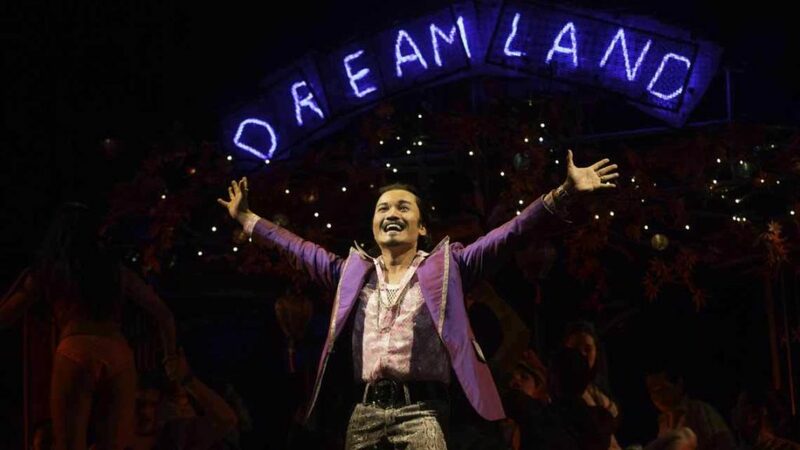 Jon Jon Briones is a true professional and has not let his act slip in the slightest. He IS the Engineer – he handled the comedy perfectly to pull off a spectacular American Dream but had serious presence when manipulating his way. He was a strangely likeable character and easily the most applauded during bows. Rachelle Ann Go once again gripped me with Movie in my Mind. Boy that girl can sing! Alongside her Eva Noblezada (Kim) is clearly one of the best West End finds in years. You struggle to believe she is making her professional debut in this show. At the age of 18 she brought a maturity to her performance like you wouldn’t believe and embodied the role at every emotional turn. A beautiful voice and acting talent that brought me to tears for the fourth time out of four. Playing alongside Eva, Alistair Brammer (Chris) certainly encompassed the masculine American GI but unfortunately not the ‘star-crossed lover’. Together they are starting to look a little rehearsed and it is Eva’s individual scenes that truly convince me of their love. I was distracted by Alistair’s obvious vibrato on almost every note although he did redeem himself with his scenes with Ellen later in act two where I started to believe the internal struggle he was going through. Speaking of struggles, I still can’t accept Hugh Maynard’s riffing at the end of Bui Doi. He is a fantastic singer and doesn’t need to ‘show off’ his voice – the song does that already. The simplicity of the men singing together in harmony is what makes Bui Doi so powerful. Take note Laurence Connor! But these are minor aversions and certainly do not detract from what is without doubt one of the best shows in the West End right now. It has everything; drama, comedy, emotion, a gripping story, a breathtaking set and an outstanding cast. Long live Miss Saigon 25! In a new feature to my reviews, I am going to start highlighting a standout ensemble member whose talent caught my eye for all the right reasons. For Miss Saigon it has to be Jon Reynolds. An emotional performance in Bui Doi almost brought me to tears and he makes the American Dream choreography look as if it was made for him.